Insect hotel? How to build an amazing bug hotel. We built our insect hotel out of leftover building material and we also collected twigs and branches we found on a family nature walk. It was definitely a fun project to do with the whole family and a great way to educate the kids on the difference between the good guys and our unwelcomed guests the pest. Building an insect hotel helps provide cover and short-term accommodation for beneficial insects when they arrive. It’s also a good idea to provide food for the insects by planting flowers close by. This is an organic form of pest control, as some of the beneficial insects feast on the pests when they are attacking our crops. It also, very importantly, assists with pollination. Beneficial insects in a food garden include ladybirds, lacewing, parasitic wasp, praying mantis, hoverflies and of course our bees. All of which can offer assistance at your time of need. It’s pretty amazing when the cavalry arrives just in the nick of time. Working with nature will also provide your family with nutrient dense, chemical free food you can pick fresh as you need it. It doesn’t get much better than that. 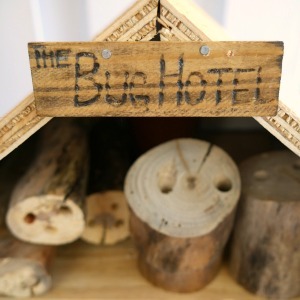 Our amazing bug hotel was also featured on Kidspot. Teach the kids the difference between the good guys (beneficial insects) and our unwelcome pests and make this adorable retreat for your local bug friends. *Note: An insect hotel can be any shape or size. Your objective is to provide shelter and small spaces which are dry and safe for the insects to stay. Start with a base and add some feet to keep it off the ground. Construct three sides and attach to your base. We have designed ours with three sections. Work out your design and add shelves using a cross support for the shelves to sit on. This will determine the height of your bug hotel. 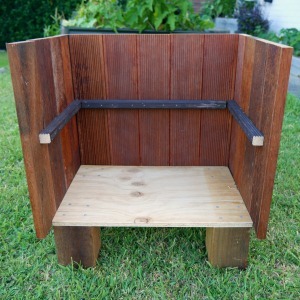 Once the sides and shelves are attached, add the roof. You can have a flat roof or pitched like ours. Drill holes in your wood to create spaces for the insects to live. You can use various sizes and shapes, get the kids to look for bigger branches you can cut up and add. 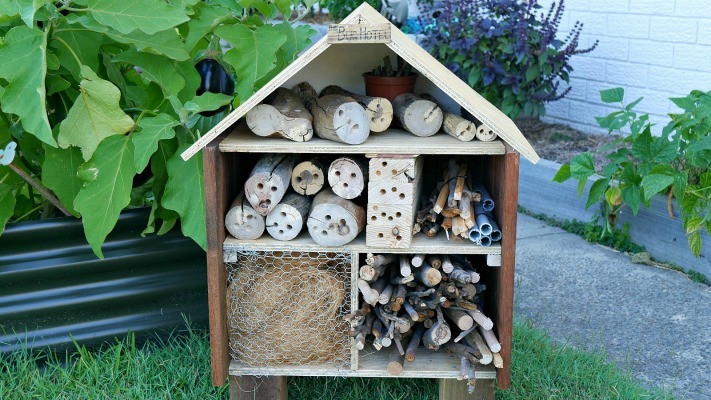 Don’t drill right through, as the bugs like to feel safe in their insect hotel. Fill pots with small branches and tightly pack them in so it’s nice and secure for the insects. If they move around, the insects will not feel as safe. Section off some parts to create different habitats, just like we have done using the coconut fibre. Cover these sections with chicken wire so the birds don’t help themselves to your materials. If you are using off-cuts of conduit pipes, tie them together with a cable tie so they don’t move around. Make sure they are tightly packed together. Place your bug hotel amongst your food garden, and to ensure your hotel guests have lots of food, don’t forget to plant some bee-friendly flowers as well. The most important thing is that you don’t get bogged down in replicating our version. Like we mentioned before, an insect hotel can be any shape or size. We have mostly used off-cuts and things we found in our shed. 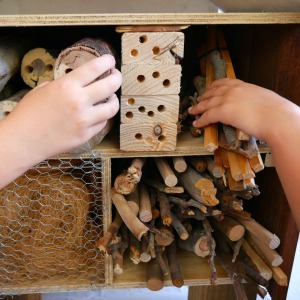 Creating your insect hotel using upcycled material will be ticking the sustainability box as well.